Pools Plus is the place you want to shop for chemicals and supplies to maintain your pools and spas. We carry BioGuard, SpaGuard, Nature 2, Baquacil, BaquaSpa, Haviland and Sustain brands, just to name a few. Stock up on chemicals and supplies at a location near you or CONTACT US and we can ship them to you. If you spend more than $50, shipping and handling is free. Having trouble finding what you're looking for? Call us at 616-949-7979. If you need spa or pool parts, then Pools Plus is your source. 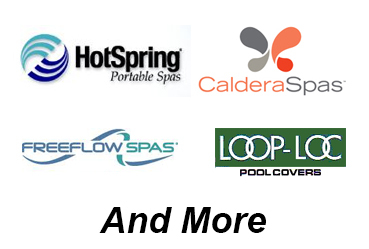 Loop-Loc Pool Covers, HotSprings spas, Caldera Spas, and Freeflow Spas, are just a few of the name brands we cary. Having trouble finding what you're looking for? We can help you find exactly what you need to keep your summer running smoothly. Call us at 616-949-7979. Or, stop by and see us at a convenient location near you. Let us know how we are doing. Customer Feedback Form.